Isabella doesn’t just hula hoop, she brings her own style of rhythm and dance to the hoop. Isabella Hoops solo performances highlight her charm, flirtatious energy and her quirky humour as a performer. 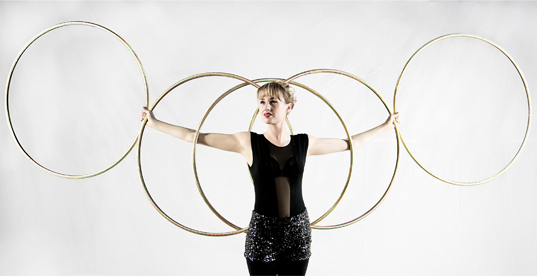 These hula hoop performances are tailored to help you create an extraordinary event that won’t be forgotten. Watch her dazzle your crowd with her fantastic costume changes and a grand finale of 50 hoops! Isabella will dazzle your party as she roams around your event, interacts with your guests and helps keep the energy up throughout the night! Can I hire Isabella to perform a choreographed show? It’s an Isabella Hoops Dance Party! Everyone will want to jump in and join Isabella for her uniquely entertaining, 30 min hula hoop show, full of fun and quirky audience participation opportunities. People will walk away loving the hula-hoop and taping their toes, guaranteed! This high-energy show is perfect for a street festival. Isabella is happy to tailor her costumes to match your brand, colours, or current promotion. Looking for someone to set the tone at your next event? Isabella considers herself a specialists in enhancing the atmosphere and breaking the ice at events!